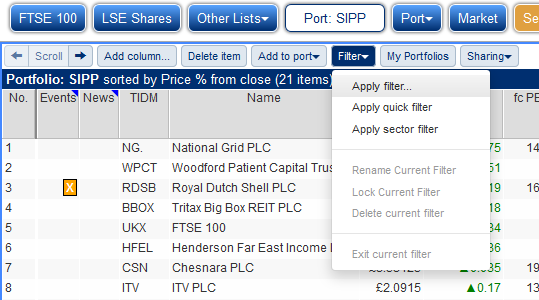 We have added lots of new filters to the SharePad library in order to help you with your search for winning shares and other investments. We hope that you will find them useful. These range from simple filters based on one or two criteria to more sophisticated strategies based on multiple screening criteria. All of them are meant to be easy to understand and many have been created by our analyst, Phil Oakley. Guru filters - based on the methodologies of well-known investors. 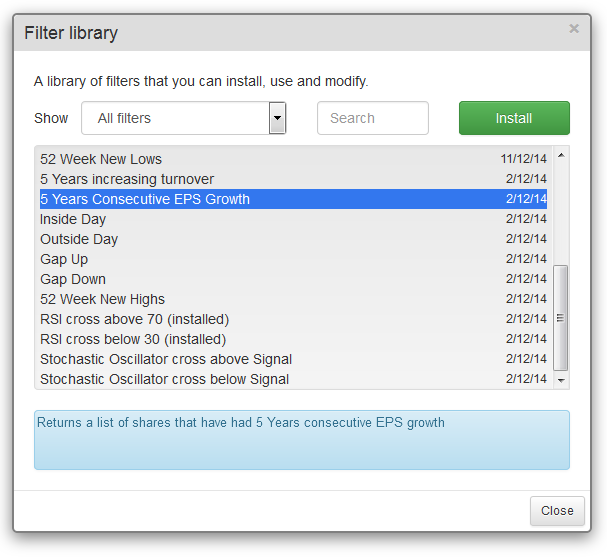 Strategy filters - filters that encompass an investing or trading approach. Phil Oakley article filters - filters from Phil's articles. Value - identify instruments which may be undervalued. Growth - identify instruments with growth characteristics. Income - aimed at investors looking for income. Quality - looking for shares with quality characteristics. Momentum - identify instruments with share price momentum. Technical - based on technical signals which may indicate momentum or a change in trend. Many filters are in more than one category and many are deliberately simple - designed to help you generate investment ideas. Some of the move sophisticated investment filters can be found in the Strategy category. It is important to remember that filters should not be used as a list of shares for you to go out and buy, but as a starting point for your research activities. Some of the Guru filters don't, at times, return many or any results. That's because they are looking for exceptional stocks. At present, with the UK and US stock markets trading at high multiples, many stocks will be ruled out on valuation grounds. It is up to you if you want to relax some of the criteria to generate more results - or wait until market conditions are more favourable. When we talk about value as investors we are really interested in shares which are undervalued. But don't confuse cheap with undervalued. As with all things in life, some stocks are cheap for a reason. Some of our simpler value filters identify shares which are cheap when measured by a particular ratio. It is up to you to do more research - or add more criteria - to identify which ones are undervalued. 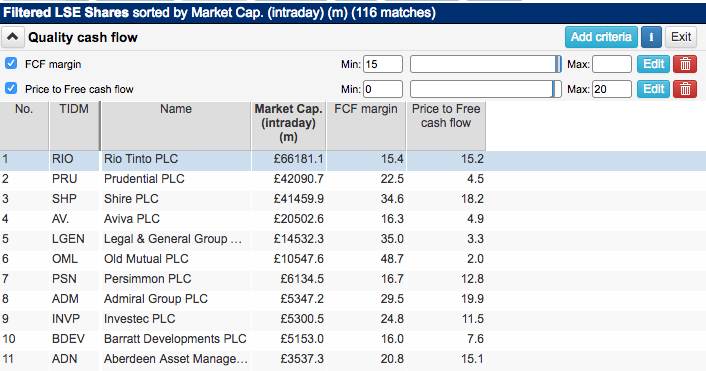 This filter looks for companies with large net cash piles which are bigger than the current market capitalisation of the company. Enterprise value is market cap plus net debt so a large net cash position can lead to a negative enterprise value. It might be telling you that the company can effectively be bought for free and might signal that its shares are very cheap. Bear in mind though that a company's balance sheet cash and borrowing levels are a snapshot taken at the end of its financial year. They may not be representative of levels throughout the year. Most companies tend to choose a year end when its finances look at their best. Another thing to be mindful of is that cash might be earmarked for new projects and the balance will decrease in the future. This tends to be true of resources and mining companies. A company's EPV per share is a value based on the company's current after tax trading profit staying the same forever. Companies whose shares are trading at a discount to EPV might be cheap. You need to pay particular attention to whether trading profits (EBIT) are sustainable or have reached a cyclical peak. This filter attempts to weed out companies which look cheap because their profits are expected to fall by only selecting those whose profits are expected to keep on growing. This filter screens for shares trading below net asset value (NAV) per share. These filters can sometimes reveal cheap shares but often they just show you the shares of companies which are struggling. In other words, the shares are cheap for a reason. The Piotroski F-Score looks at companies on a number of fundamental quality and safety criteria and gives them a 1 point score if they pass each one. A Piotroski F-Score of more than 7 is seen to signal a company with improving fundamentals. 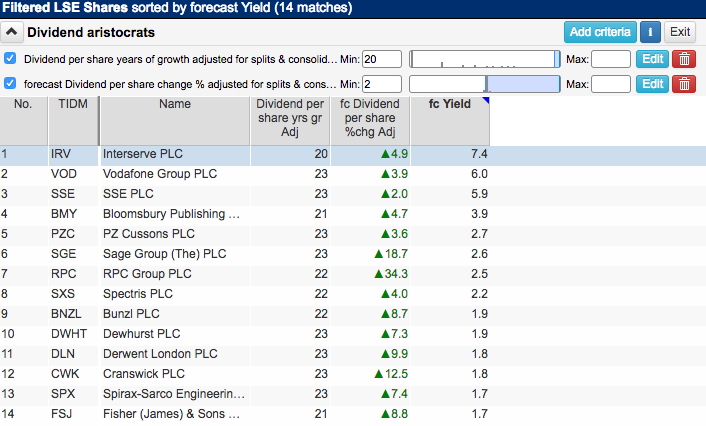 Combining this with a valuation of less than NAV per share might throw up some winning shares. This filter looks for companies with reasonable returns on equity (ROE) and which are trading for less than NAV. The theory here is that companies with a sustainable ROE should see their share shares trade for at least NAV as a 10% return on that NAV (or equity) suggests that the assets are worth what they are stated in the accounts. The key word here is "sustainable". If the ROE is not sustainable then the shares may not be cheap. This is a filter for very cheap shares. It is based on a strategy used by the legendary US investor Benjamin Graham. NCAV is defined as a company's current assets less total liabilities. The value of fixed assets such as buildings, plant and machinery is ignored. 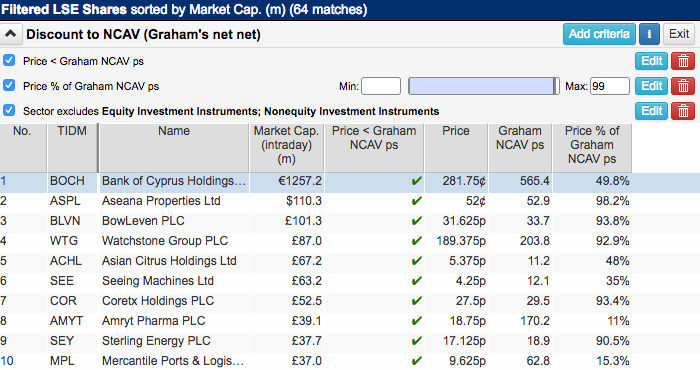 Graham reckoned if he could buy shares for less than NCAV per share (he usually looked at 67% of NCAV or less) then he was unlikely to lose money and could end up making a lot. This is a simple and powerful investing formula which combines high quality companies with cheap valuations. The companies are ranked on ROCE and EBIT yield and then ranked in descending order by their cumulative score. 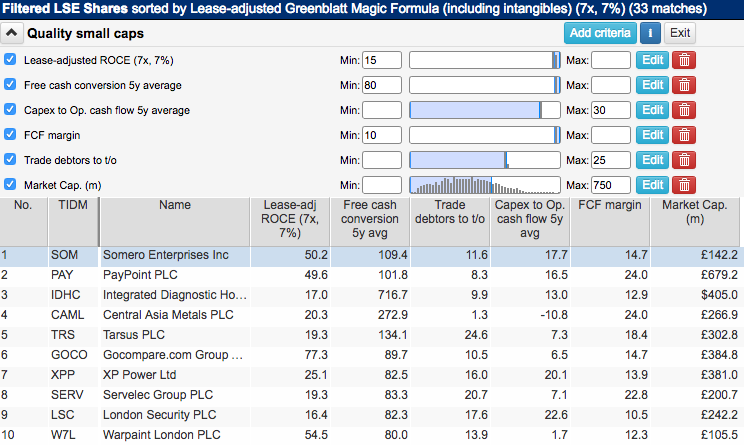 SharePad also offers a more comprehensive version of Greenblatt's Magic Formula where the ROCE and EBIT yield are adjusted for hidden debts (from leasing assets). This is arguably a better way of selecting quality and cheap shares. Smaller companies can make great investments but they also come with lots of risks such as dodgy accounting. Companies with lease-adjusted ROCE of 15% or more - this is a sign of high quality. Free cash flow conversion averaging more than 80% over the last five years. Profits which have been converted into cash are unlikely to be bogus. A capex ratio averaging 30% or less over the last five years - i.e. companies that don't have high investment requirements. A free cash flow margin of at least 10%. A high proportion of turnover turning into free cash flow. Trade debtors to turnover ratio of 25% or less. A high ratio can be a sign of a company overtrading and risking bad debts in order to achieve high turnover growth. This growth may be of low quality if a company has to offer generous credit. The creditors may not be able to settle their bills in the future. A market capitalisation limit of £750 million to screen for smaller companies. A simple cash flow filter which looks for companies with high free cash flow margins and trading on a price to free cash flow multiple of less than 20 (the ceiling I set for a reasonable price). We've included a number of dividend-based filters and I've covered a few in my weekly articles. They are all variations on a theme and you can choose the one(s) which suit your requirements. If want to find companies with a long uninterrupted history of paying and growing dividends, you may like the following filter. A filter which looks for companies that have grown their dividends for 20 consecutive years or more and are expected to keep on growing them. You might want to add in a value criterion. Companies that can keep growing their profits make attractive investments but only at the right price. Overpay and you are likely to make low returns or even losses. This filter looks for shares where the PEG ratio (PE divided by EPS growth) is less than 0.67. We've also included a criterion which uses forecast PEG if you prefer. You can toggle between the two or activate both if desired. This strategy was used by Jim Slater and was explained in his book The Zulu Principle. Note that the current PEG is calculated using EPS growth between last reported profits and year 1 forecast profits. Forecast PEG uses the year 1 and year 2 forecasts. This filter specifies the turnover and EPS growth requirements, adds in a quality factor (ROCE) and a more relaxed PEG limit of 1. Our momentum and technical filters may be useful to traders and investors alike. Traders can apply these filters to any list - shares, indices, commodities or forex - to find long and short trading opportunities. Investors might look for momentum investing prospects or simply use bullish chart signals to support their investment decisions and timing. To access these filters, click on the Filter button in the List view and then select Apply filter. There are dozens of filter in the library. Notice that you can filter this list using the drop-down menu. In the example above All filters are currently being shown. 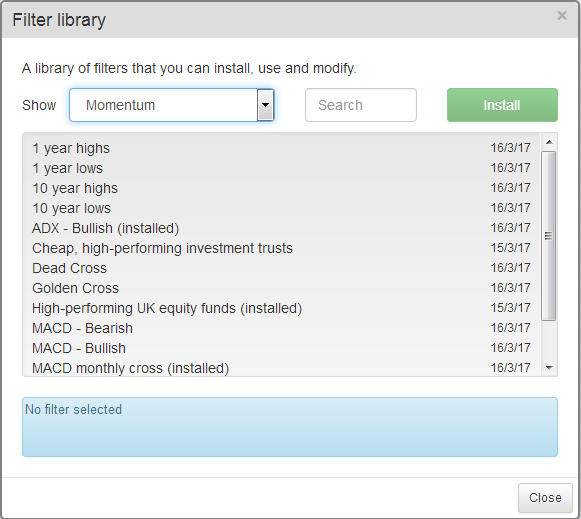 To add one of the filters to your filter list, select the one you want and then click on Install. You can see a description of each filter in the panel at the bottom of the dialog. Click on the Close button when you have installed the required filters. Once you had have added a filter to your list, you can rename it, or copy it and customise it by adding extra criteria. 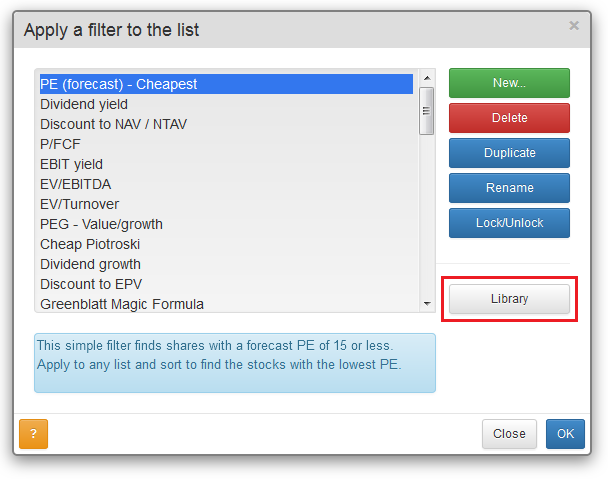 When you apply most filters, they will be applied to the current selected list or portfolio. Change the list if required using the usual list buttons on the SharePad toolbar. Some of the library filters however have an associated (e.g. 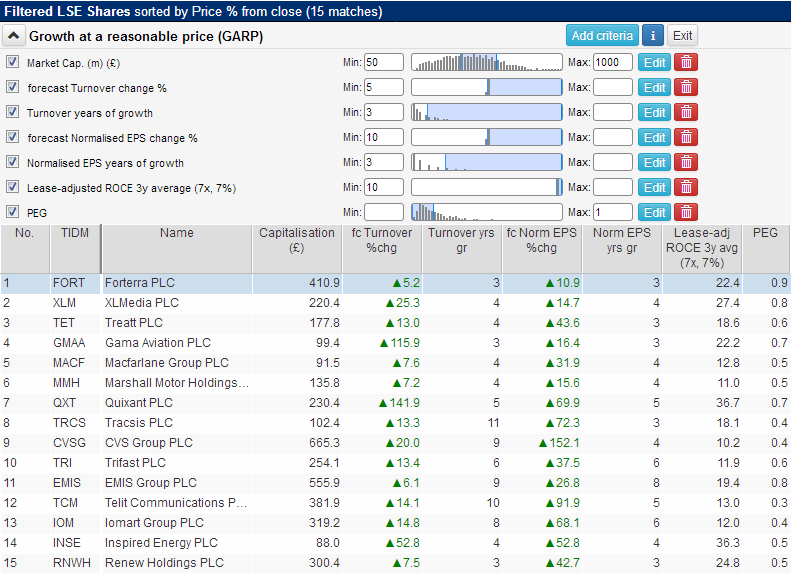 LSE shares or Investment trusts). These filters have the name of the associated list displayed next to them when you have installed them. When you apply one of these filters, SharePad will change to the associated list. You can still change the list on an ad hoc basis whilst looking at the filter by clicking on the Other lists button or any of the other List buttons. The next time you use the filter it will revert back to the associated list. If a filter has an associated list, you can change it by clicking on the Filter button and selecting the Change details option. If you need any help whatsoever with filters, please don't hesitate to call our friendly support team on 020 7749 8555.